It is hard to think of a quicker way of making a vegetable salad. 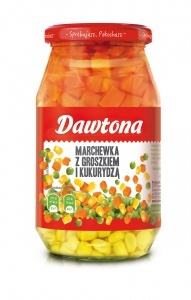 Finely chopped carrots, sweet and delicate peas, potatoes, juicy pickles and parsley not only guarantee a unique flavor, but also cut the salad preparation time down to less than 10 minutes! Just add the mayonnaise and favorite seasonings. Product available in 570g cans. Time for a culinary fiesta! A mix of green peas, corn, carrots, peppers and red beans is perfect as a salad as well as an addition to other tasty dishes. Just add a few favorite ingredients and enjoy an authentic quesadilla or Mexican style soup! Fast, warm side for serving with homemade meatballs? 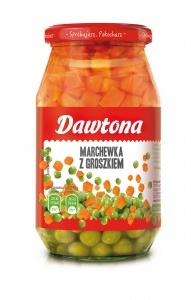 Carrots and peas are a perfect match! Thrown into the pan with butter, salt and a pinch of flour, they turn into a unique, tasty and nutritious side dish in just a few minutes. Product available in 510 g jars. The classic combination of carrots and peas complemented by crispy corn is an excellent and quick idea for a salad. On the other hand, addition of thick, buttery roux will just as well turn them into an excellent dinner side! 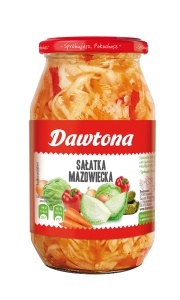 White cabbage, carrots, pickled cucumbers and a touch of pepper - these are the delicious, light and crispy ingredients that form a Masovia style salad, an excellent addition to cutlets or meatballs. It only takes a moment to make a "potato" version of this salad, which tastes just as great. It contains no preservatives! This delicate, sweet and sour salad for pickle lovers goes perfectly with a warm, dinner dishes, especially in winter. It can also add some culinary variety to a summer barbecue. It contains no preservatives! Product available in 900 g jars.